EDUCATIONAL LEADERS – Not sure if programs are meeting requirements? Finding it difficult to review on a regular basis? Wondering how to collect evidence of your support for A&R visits? Here is your solution! Use this guide and checklist tool to help you regularly review, reflect on, simplify, identify gaps and discuss Educator room programs and planning documentation while keeping clear evidence of your commitment to support team members and their ongoing professional development! 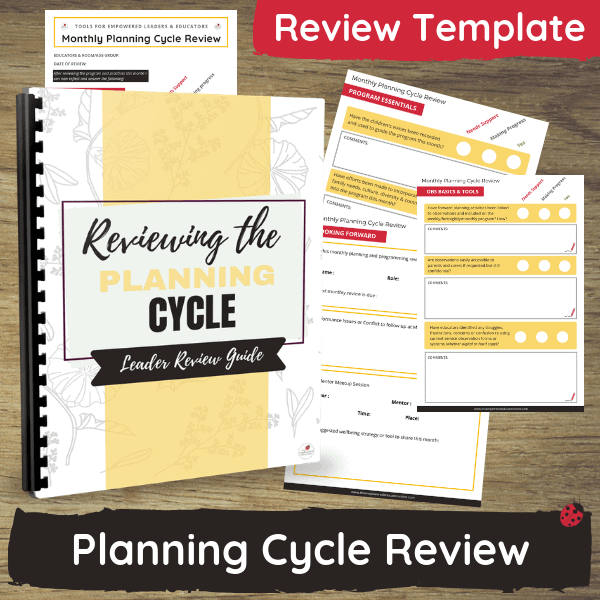 HOW CAN I USE THIS PLANNING CYCLE REVIEW TOOL? Identify whether the programs link to current service philosophy. Explore if efforts have been made to incorporate family needs, culture, diversity & community into the program this month. Identify any possible professional development needs or further support required for the group/educator. Reflect on methods for recording and incorporating the child’s voice into experiences and forward planning. Guide educators toward understanding each step of the planning cycle and WHY they have been asked to document each step. If reflection is being used to inform educators’ programming and day to day practice. Examine whether the program has provided a range of learning outcome opportunities across all areas of the relevant standards, framework and/or guidelines. Whether observation tools and apps are being used meaningfully and correctly or if further support/training is required. How to set up and use portfolios effectively while also managing time constraints. Set up an easy to follow action plan with timeframes for individual educators. Show evidence of ongoing support and commitment to the effectiveness of the service programming cycle and continuous professional development in this area. 19 pages in PDF format with editable text boxes so you can either choose to print and add to a folder to take on the go with you or keep on the computer and type, printing only when necessary instead. Looking Forward (Goals, action steps, timeframes).